In the days of social media and over-sharing, Ancient Posse stand out for their secrecy. 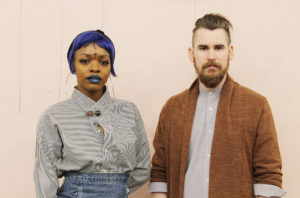 The duo — Steven Bergeron (keyboards and vocals) and Kamillah Jonaé (vocals) — don’t like to discuss the band’s origin story, except to say they began making music together in 2014. They won’t reveal how they landed on their band name, but allow that it is an anagram. “We spent three years writing and not showing anybody our stuff,” she says. “There were at least three times in those three years where you (Jonaè) were like ‘Alright, let’s go show everybody’ and I’m like ‘No, we can’t,’ ” Bergeron says. Eventually Ancient Posse played their first ever show at the Vaudeville Mews at the end of 2016. Since then the band has been on an upward trajectory rarely seen in Des Moines. A year after their first show, the pair played at 80/35 in 2017, then the inaugural Street Heat Festival over Labor Day Weekend 2017, an IPR Studio One Underground set in February, the Des Moines Music Coalition’s Backstage Ball last month and are set to play Mission Creek in Iowa City in April and Hinterland in August. “It’s really cool, checking off all the awesome opportunities that there are here and doing them,” Bergeron says. Their impressive resume is made all the more impressive by the fact that they are yet to release their debut album. The only morsel of the breadcrumb trail so far is their video for “Windless” on YouTube, with their debut album set to drop in late summer/early fall. While their well-curated Instagram labels their sound as “synth, soul, pop,” the two say it’s more complex than that. “I can’t put ours in a genre; it’s kind of a combination of things. I’d say it’s soul rattling and inspires you to feel and move,” Jonaè says. “I’m excited for people to put a term on it,” Bergeron adds. Whatever labels they may attract, they unanimously agree it falls in the category of electronic music. “I think it’s the future, and we should embrace it,” Jonaè says of skeptics. “We’re playing real instruments; sounds are just made not by a vibrating string, but it’s still real. There’s still a stigma even though electronic music has been around for 40 years or more,” Bergeron says. For their eclectic style of music, both band members agree they’re largely inspired by pop music. “I think pop music gets a lot of hate, but we’re inspired by Beyoncé and Lorde as much as anybody else,” Bergeron says.